Bar opens 5pm, bands from 6pm, DJs til 4am. Free entry all night. DOGHOUSE - one man punk rock circus mixing tragedy, comedy and existential theatre amidst a backdrop of techno beats and dystopian visuals. 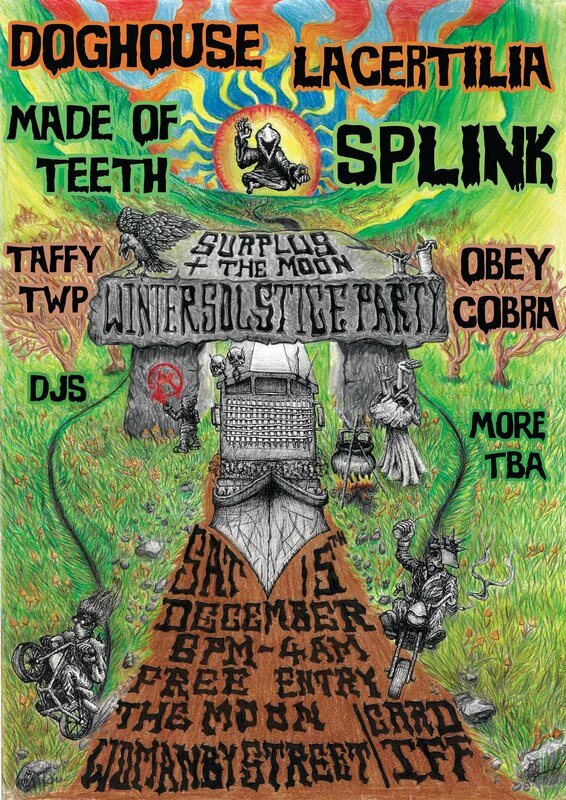 SPLINK - party-starting Devonshire 6-piece will be booting out an infectious mix of jazz, ska, reggae and punk. For fans of The Blockheads, Madness and The Stranglers. OBEY COBRA - Dreamy psych, abstract weirdness and noise rock that draws you in to a strange, dark little world that you might never escape from..
MADE OF TEETH - Absolutely banging riff machine that relentlessly clobbers you about the head. Heavy metal and raw punk rock. TAFFY TWP - Acoustic riot folk that tells it like it is. Visit the Facebook event page for this show.